My mind was racing as I drove the 35 minutes up Interstate 5 to the United Methodist Church in the seaside suburb of Seattle called Edmonds, WA. I had never photographed a wedding there before, but I had actually never met these two before. I have to say that their church wedding goes down as one of my favorite I've photographed so far with a church that was full of nice, warm light. The groom and groomsmen did their preparations in the band room found in the church's sprawling basement. Surrounding by tubas, timpani and a giant set of vibes, the guys donned their tartan ties for this stylishly Scottish wedding complete with bagpiper. The girls got ready in the church's library that provided an excellent environment with the texture of books everywhere, robins egg blue paint and soft light casting in through the generous windows spanning the room. 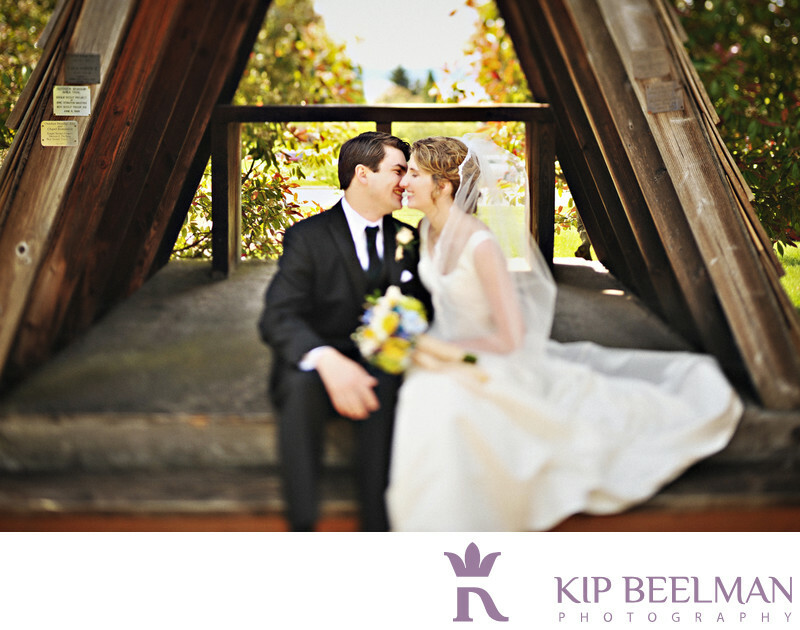 A first look was done on the church's grounds where they have a lush garden and a mysterious little a-frame building that provided a little respite from the intense August heat. While the two were sitting I just couldn't help but put on my tilt/shift lens for a surreal presentation of this funky little building. Later we explored the beach and boat slips of the Edmonds waterfront for gorgeous wedding photo after photo before returning to the nearby Edmonds Conference Center for all the wedding reception highlights including (but not limited to): The Electric Slide, 1st dances, cake cutting, toasts, some breakdancing backspins and just a good ol' time. Big thanks are due to the talented and sweet Jenny Wohrle for inviting me along. Location: 828 Caspers St Edmonds, WA 98020. Keywords: Church Wedding (21), Edmonds (3), Washington (15).